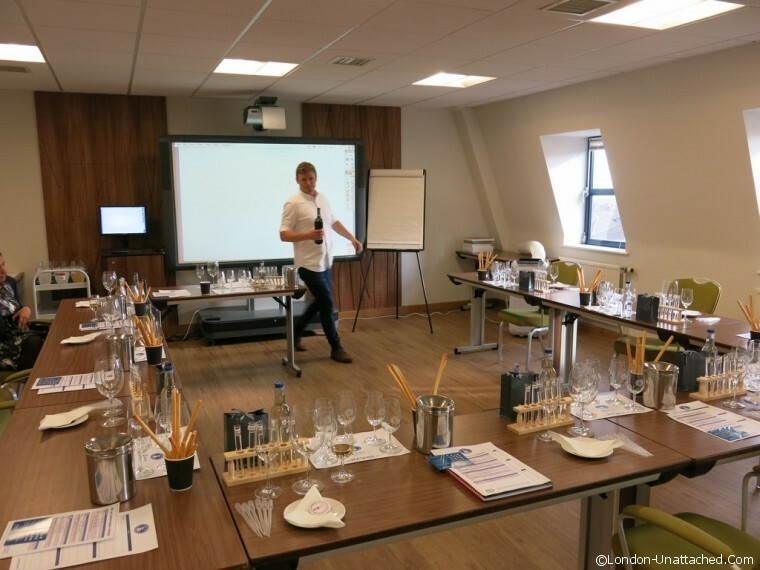 Many places offer wine tasting of one sort or another, but the chance to do a wine tasting course at the Wine & Spirit Education Trust (WSET) was a bit special. Rather than just sipping and saying nice thing, the WSET course is a chance to really learn about wine and to get a better understanding of our own tastes and palettes. Our trainer for the evening was Jim Gore, who clearly had a real love of wine. He lived in Burgundy, and worked for wine distributors before joining WSET to share his passion. 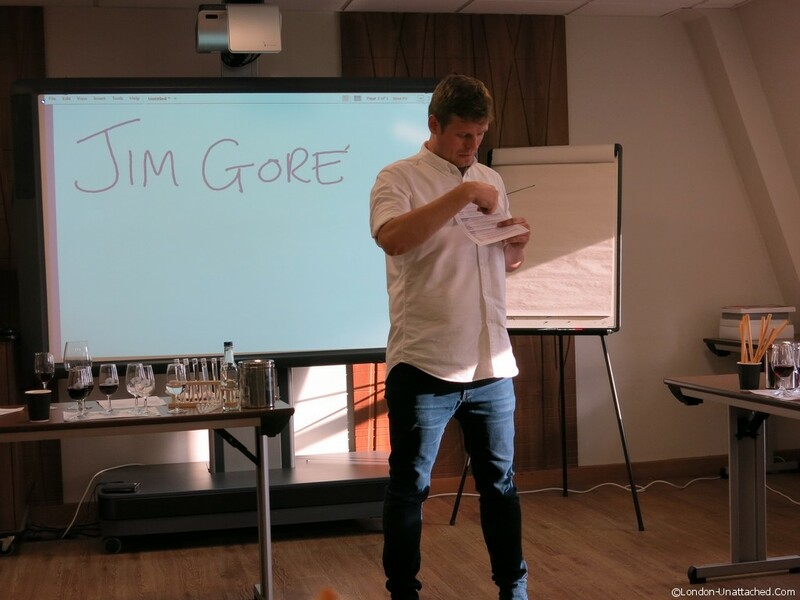 At each stage of the course, Jim showed us what to do and explained in plain English what everything meant. He made us all feel comfortable and actively encourage questions and discussions. There was no wine snobbery here, and how we were tasting was different from anything we had done before. When comparing wines, it is invaluable to be able to taste them side by side. That’s what were able to do at WSET, with Jim explaining what to look for as we moved up and down between the three reds. As we tried each and noticed the differences we went back and resampled them to develop our ability to notice flavours and aromas. Jim pointed out that the shape and style of the glass both changes your perception of the wine, as well as actually changing the taste. Glasses that close up at the top keep the aromas in and limit access to the air, not letting it ‘breathe’. He pointed out that there was a WSET standard wine glass so that the conditions were the same for each test, but that you would usually have different types of glass at home which are more appropriate for the wine type. In wine tasting, two words keep coming up so I thought I might as well explain them in simple terms. Tannin is the presence of phenolic compounds that add a bitterness to wine. Phenolics are mainly found in the skins and seeds of wine grapes but can also be added to wine with the use of aging in wooden barrels. Acidity refers to the fresh, tart and sour attributes of wine which are evaluated in relation to how well the acidity balances out the sweetness or bitter components of the wine such as tannins. There are three primary acids found in wine grapes: malic, tartaric and citric acids. 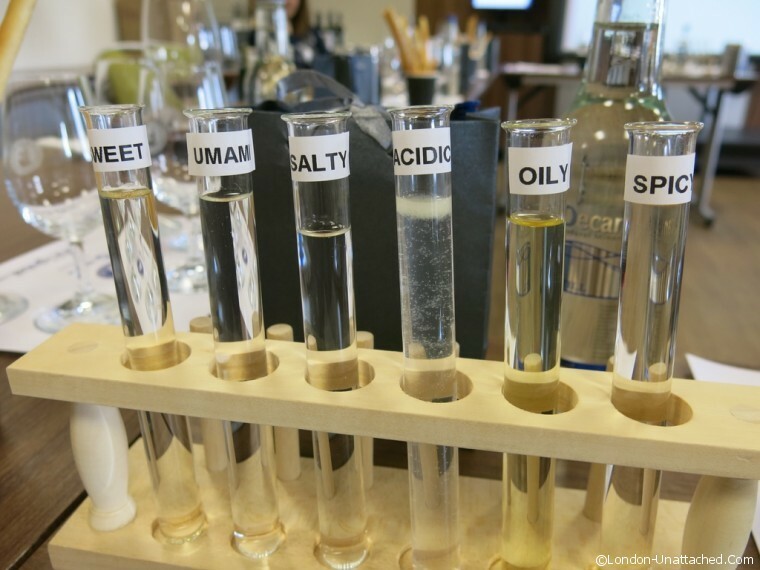 Being able to identify each of these elements is a foundation to identifying how they will work with food pairings. To help do this we had a test tube rack filled with various flavours to simulate different food types. Simple to use, we squeezed a small pipette of liquid from a test tube into our mouth and let the flavour swirl around. Then we tried a wine and noted how it tasted. Keeping a list, we worked through different options to identify what we thought best for our own palettes. Taking notes, and using the handouts we were able to get a real understanding of which wine worked with which flavour of food. It certainly goes a long way to giving you the help to choose a bottle of wine type that will work with your food choice and impress your guests if dining out. Some things came as an eye opener to all of us. White wine like Chablis, which is acidic works well with salads and olive oil dressings (not just because its great chilled in summer) as the oil makes the acidic wine feel lighter. But salty food makes all wines, especially reds taste better. In our testing, we all thought the cheapest red was as good as the expensive Barolo after the salty test tube. It is no wonder that some restaurants offer salted nuts and olives in brine before you choose the wine. So with white and dark chocolate, cheese & Parma ham skewers or hot pepperdew and mozzarella, can you decide which wine will go best? 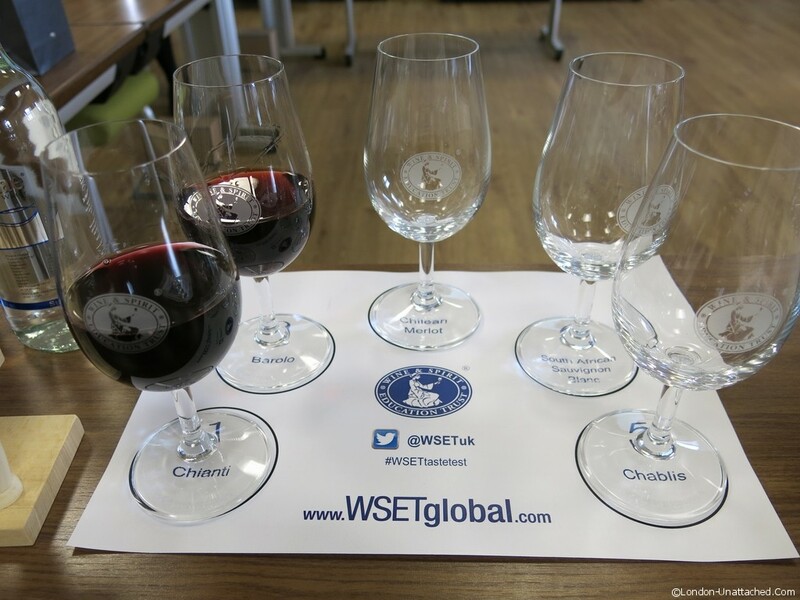 The WSET courses are the only Government Approved Qualification in wine and is recognised around the world. They have over 150 course providers in the UK, and courses are available in 18 languages in 63 countries around the world. I took a sampling course in London, but there are many course centres around the UK so there is bound to be one near you. 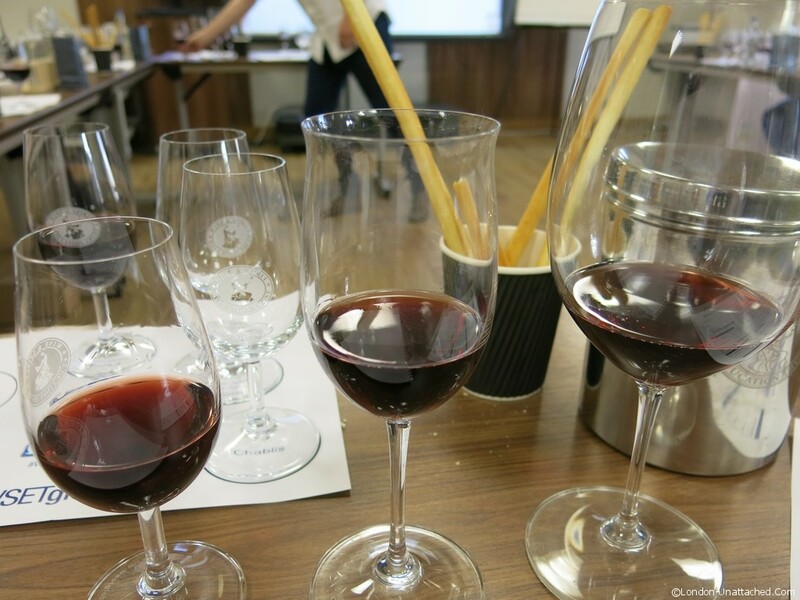 A one day course costs around £150 and that includes all the wine you need for tasting. It certainly is great value, and gives you a recognised qualification, on par with a GCSE. It is no surprise that most bars and hotels send their own staff on these courses to give them a good grounding. What a wonderful program. This is very similar to perfumery. I am sure you learned a lot, and you were no slouch in the wine department when you started. I have learned so much about wine by attending sessions like this one! Looks like you had a good time. Hmmmmmm, xmas present ideas for my OH. Great tip about what makes red wines taste better. I know even Simon was amazed at the amount he learnt. And he is quite well informed to start with! I want to go – this sounds utterly fascinating! This really was one of the best events I have been to in a long time. And Jim Gore has an enthusiasm for wine that is contagious. I knew it would be your thing Simon. Wish I could have gone myself!